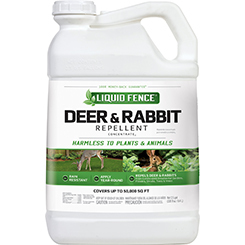 Homeowners, gardeners, professional landscapers and commercial growers have discovered Liquid Fence® Deer & Rabbit Repellent Concentrate2 works on scent, so deer and rabbits don’t even have to take a bite to be repelled. 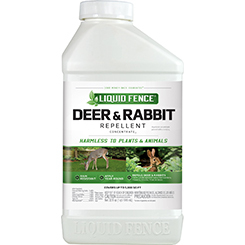 Because the animals’ natural aversion to this scent will never diminish, this product DOES NOT have to be rotated with other repellent brands. SHAKE WELL before each use. 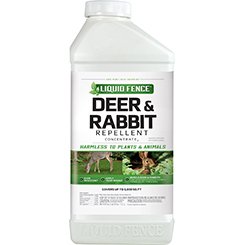 Add 12.8 fl oz of Liquid Fence® Deer & Rabbit Repellent Concentrate2 for each gallon of water and thoroughly mix. With garden sprayer or sprinkler, apply liberally to plants and their perimeter during a dry period. Repeat process one week later and then approximately once per month thereafter. 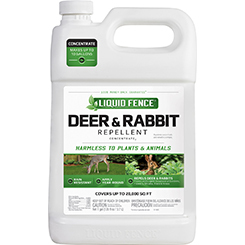 Areas where feeding pressure from deer and rabbits is intense, spray Liquid Fence Deer & Rabbit Repellent Concentrate2 once a week for three weeks and then approximately once per month thereafter. Please note: when using this product you may notice an odor. However, once it dries, the odor will not be noticeable to humans, but still very noticeable to animals.